According to the U.S. Geological Survey’s latest California earthquake forecast, the estimated chance of that state experiencing a massive earthquake within the next 30 years has nearly doubled. 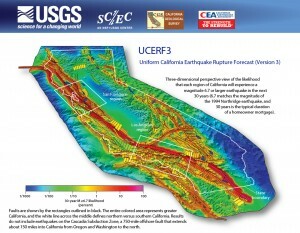 In a press release Tuesday, the USGS said the Third Uniform California Earthquake Rupture Forecast, or UCERF3, improves upon previous models by incorporating the latest data on the state’s complex system of active geological faults, as well as new methods for translating these data into earthquake likelihoods. Compared to the previous assessment issued in 2008, UCERF2, the estimated rate of earthquakes around magnitude 6.7, the size of the destructive 1994 Northridge earthquake, has gone down by about 30 percent. The expected frequency of such events statewide has dropped from an average of one per 4.8 years to about one per 6.3 years. However, in the new study, the estimate for the likelihood that California will experience a magnitude 8 or larger earthquake in the next 30 years has increased from about 4.7% for UCERF2 to about 7.0% for UCERF3.